The whole 911 range has been revised to include energy-saving turbochargers, but it’s the new Porsche 911 Targa 4 that’s arguably best suited to the controversial new turbocharged 3.8-litre engine. Just as gutsy as its naturally-aspirated predecessor, it’s not lost any performance but has gained an edge over its rivals by virtue of the fact that it’s now more efficient and more economical. It is, however, a mid-range performance car. This is certainly a benefit in terms of improved running costs and cruising ability, but any purists should probably look away now. It still looks drop dead gorgeous too, but handling is hindered by the folding roof mechanism, which adds a bit of bulk to its slender, almost balletic frame. Porsche, though, has countered this extra weight by adding more power to the engine, which ensures 0-62mph is taken care of in just 4.5 seconds. 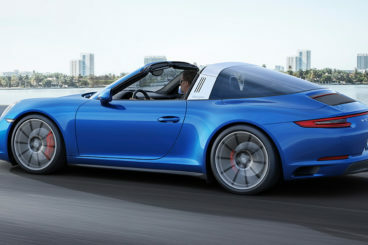 OSV takes a closer look at what this speedster is all about with our Porsche 911 Targa 4 review. The new turbocharged 3.0-litre engine has come under fire from keener drivers who have protested about the fact that the car’s traditional bark will now be suppressed. While this is true, the new unit still emits a decent amount of grunt – as well as plenty of power. 365bhp is needed to give this rather heavy sports car enough shove to rocket you from rest to 62mph in 4.7 seconds. There is also 450Nm of torque on offer from 1,700rpm. The Targa 4 has more flexibility than the model it replaces; you can keep it in gear while letting the engine pull. Last time around, you had to switch down and use up extra revs. The seven-speed manual transmission is easy to live with. The shift action is well weighted and super accurate. There is a decent amount of grunt from the engine lower down the rev range, but it does grow hoarser the higher you climb. Still, it continues to be full of song even at its rev limiter – 7,500rpm. The 911 Targa 4 is fitted with four-wheel drive as standard and there is plenty of traction available whenever you need it. The steering is accurate and allows you to position the car exactly where you want it on the road. There is no more or no less feedback than is needed; it’s just the right amount. Drop the roof, though and you will notice that the chassis lacks the coupe’s stiffness. Overall, there also isn’t as much flexibility as the 911 Cabriolet. Stylistically, there wasn’t really anything wrong with its predecessor. As such, there weren’t many changes that Porsche had to make here. Revisions are minor, with Porsche simply working to make sure that the car remains fresh in the face of competition. The rear and front bumpers are new, as well as the 3 tail lights. The car also now gets a vertically slatted engine cover, which is shared with the rest of the 911 range. The defining features of the car remain pleasingly untouched. The contrasting silver roof bar and rear wraparound glass remain to give it a touch of class, but the car is now 44mm, which adds presence. Inside, the cabin looks smart, sporty, contemporary and stylish. The high-quality materials are pleasant to look at and touch, with highlights including the leather steering wheel trim, armrests and door handle. Remove the middle roof panel via the button and you’ll benefit from a thrilling driving experience that only a top-class sports car convertible such as this can offer. Buffeting, though, is a bit of an issue and the cabin is a bit blowy. 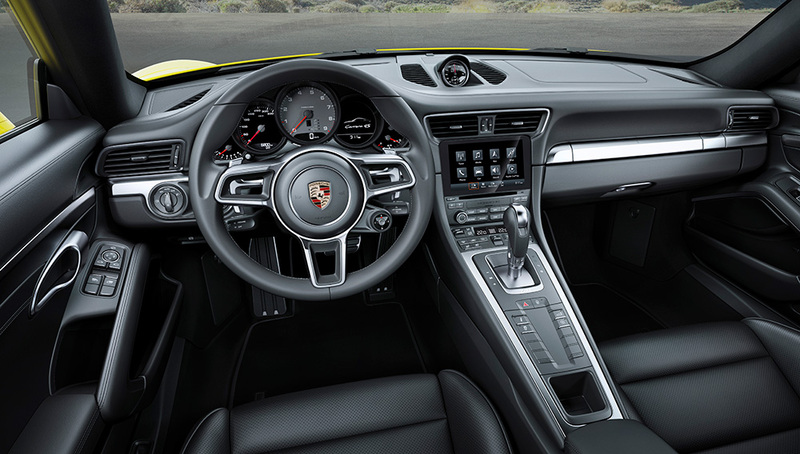 However, Porsche have added a silver roll over bar and glass screen to improve usability. Meanwhile, any kids you have can hop in for a ride, too, thanks to the fact that Porsche have decided against removing the two rear seats. Despite this, the boot still measures an impressive 285-litres, which serves to make this a rather practical sports car. The new Targa 4 has been treated to plenty of new kit. The problem, though, is that while lots of new tech benefits you in the sense that it enhances the driving experience, it does also raise the price of the car even higher. Apple CarPlay comes as standard and is part of an innovative infotainment centre, which also comes with Connect apps and online navigation. Standard equipment also includes 18” alloys, green tinted heat insulating glass, electronic parking brake, an onboard computer, a DAB digital radio, a lockable glove box, automatic headlights and LED daytime running lights. There is an array of colours to choose from. Black, Luxor Beige, Platinum Grey and Yachting Blue are your standard colours, but you can personalise your car by selecting from a range of social colours or materials, including wood, aluminium and carbon. Prices for the car start out from £90,000 and rise to almost £100,000, which represents a noticeable premium over its predecessor. If you want to lease the car over 48 months, you can get a deal starting out from around £1,350+VAT per month. Running costs have been improved, but they could have been even better were it not for the heavy roof mechanism. Still, Porsche themselves claim that it’s possible to achieve fuel economy returns of up to 35mpg from the normal car, but in this Targa 4 variant, it’s likely that you’ll be looking at average returns that hover around the 28mpg mark if you cruise along and 20mpg if you push it hard. The car emits 206g/km of CO2, which equates to £290 per year in road tax. Not many people buy a sports car at this price point and give much of a fig for the extraordinarily high running costs, but if you’ve previously been put off buying such a car precisely because it would rinse you at the pumps, it’s time to get interested. This is by far one of the cheapest sports convertibles to run in its market. This is not an out and out sports car and once you accept that, you can start to appreciate its everyday appeal. With a boot that offers almost as much space as a budget hatchback and two rear seats that can accommodate either extra bags of groceries or your kids, the car merges coupe-like spirit performance with impressive usability. The introduction of turbochargers has done nothing to blunt this car’s performance. Quick and capable of tremendous bursts of power and gusto, it’s just as high performing as ever. The 911 Targa 4 will no longer capture the imagination of the purists. The heavy roof mechanism compromises agility, while the turbochargers reduce the raucous engine noise of old. The car is significantly more expensive than last time around. While this sharp increase has been offset somewhat by the reduced running costs, you might still think it’s an increase too much. Pricey optional extras will also inflate the price tag. Let’s see how the Porsche fares against its rivals in the comparison section of our Porsche 911 Targa 4 review. The Audi R8 is now in its second generation. Like the Porsche, it’s a mid-engined supercar, that is backed by a four-wheel drive which gives it plenty of thrust. The Targa 4 might lack a bit of drama these days, but the Audi R8 does not. Blisteringly quick, it can propel you from rest to 62mph in 3.2 seconds if you really want it to. Its 5.2-litre V10 engine is naturally aspirated and is now the Porsche’s noisy neighbour. If it is engine and exhaust noise you want, this one is worth a look. 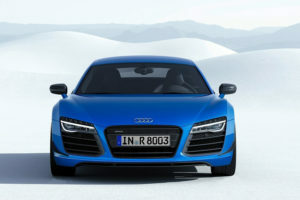 The R8 is also easy to drive. It’s stiff, though, so ride quality is not great, but the steering is precise and the traction control system is sophisticated enough to keep you out of trouble. It isn’t cheap to run, however – but did you really expect that it would be? Still, it is cheaper to run than last time around. Despite the enormity of the 5.2-litre engine, official fuel economy returns of 24.8mpg are better than what the outgoing 4.2-litre unit could manage. Push the car to its breath-taking limits, though and you’ll end up with mid-teen figures. What isn’t up for debate is that at £515 a year the R8 Coupe is much more expensive to tax than the Porsche. As always with an Audi, the interior is impressive. The sports seats sit you low, while the wraparound dash serves to create a cockpit feel. Brushed aluminium and carbon fibre inserts can be found pretty much anywhere you look, while the Virtual Cockpit system is a proper highlight. A big 12.3” screen replaces an instrument cluster and neatly displays your infotainment, speedometer and sat nav. There are only two seats in the Audi, which means any kids you have can’t pop along for a joy ride. The boot is also positively tiny and measures only 112-litres. It’s also located at the car’s nose, thanks to the fact that the car is mid-engined. All in all, this is not a very usable coupe. 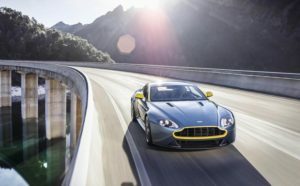 The new Aston Martin Vantage boasts classical, timeless styling, barnstorming performance – but jaw-dropping running costs, too. There are no turbochargers in sight here, just a stormy 4.7-litre V8 petrol unit which powers you from rest to 62mph in 4.9 seconds, which makes it competitive with the Porsche in terms of speed in a straight line. But while the 911 can keep up with the Vantage when it comes to pace, it can’t match its glorious engine and exhaust note. Sticking to a naturally aspirated unit means the Aston Martin has lost none of its musical character. You do have to push the engine really hard to wrench if you want to deliver all of its 420bhp, but besides potentially breaking the law, the biggest problem is the running costs. Whereas the Porsche is cheaper to run than ever, Aston Martin has blatantly ignored any attempts to significantly save you money at the pumps. As such, you won’t achieve better fuel economy returns than 20.5mpg, while emissions are so high that you’ll need to pay £505 a year in road tax. The Vantage’s interior was outstanding back in 2006. Handmade, beautifully stitched and modern, it set benchmarks. But not anymore. Sure, everything is still amazingly well put together and the fact that each cabin is hand-built is commendable. But it all looks a bit dated. The Porsche benefits from 2016 design quality, while the Aston Martin is now looking badly out of place in its sector. The Aston Martin Vantage is fairly practical though and boasts a sizeable 300-litre boot. There are no rear seats for kids, though, but it does offer a useful storage area instead. Ride quality is good, the leather sports seats are electrically adjustable and the hatchback rear door helps with loading in and out your luggage. There is pretty much a 911 for every taste in 2016 and the Targa 4 is just one out of sixteen currently on sale. The addition of turbochargers shouldn’t dull your appetite, because performance is still first rate. The bonus now is that if you snap one of these sporty convertibles up, you won’t have to fork out quite as much at the garage. This is not a 911 for the purists though. Rather, it’s a cabriolet aimed at anyone looking to relax on a balmy summer day without a care in the world, before doing a bit of shopping or dropping the kids off at school the next day. 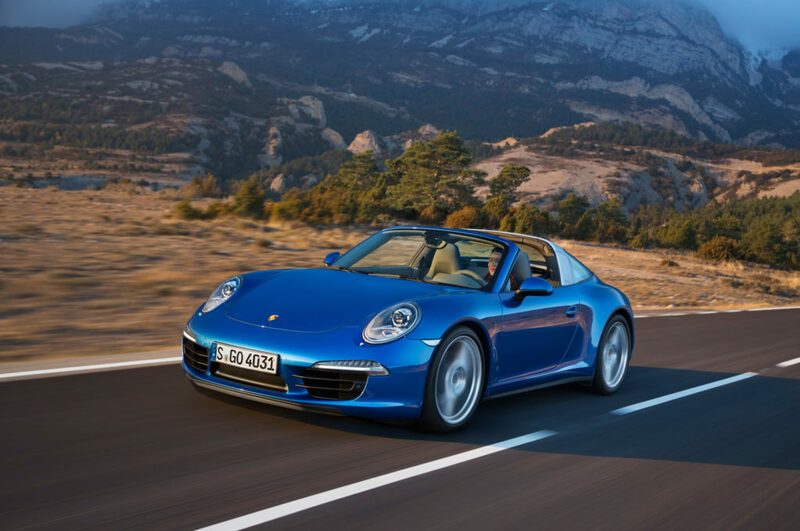 The Porsche 911 Targa 4 is a usable sports car that comes well stocked with equipment, glistening good looks and, as ever, scintillating speed.